Make your own food fireworks with homemade kimchi. This spicy, pungent, fermented vegetable dish will make any savoury recipe sparkle with added umami and interest. Try adding it to tagines, chilli, omelettes, cornbread, nachos and, of course, that Korean staple, bibimbap. Sure kimchi is a bit smelly, but goodness it’s good. And good for you. Go on, I dare you! My love for kimchi is laid bare on Instagram just about every week, mainly on avocado toast with a three-fingered pinch of fresh sprouts. Its gingery-hot vibe is a terrific way to wake up and not have to smell the coffee. Who needs caffeine when you have kimchi? I don’t have kimchi as Korean do – a punchy but fresh-tasting fermented pickle alongside breakfast, lunch and dinner. I get through a good bit of kimchi for a fermented food latecomer, but I haven’t quite managed the triple. And my uses are not at all traditional: stirred into chillis, curries, tagines (exceptional added to my chickpea and vegetable tagine instead of harissa), but also mixed into spiralised or grated veggies, like carrot, cucumber and squash, and in omelettes. Speaking of squash, kimchi isn’t just for cabbage: you can kimchi just about any vegetable, including squash. I was recently gifted a wonderful book, Ferment, Pickle, Dry, and the authors not only give recipes for fermenting, pickling and drying a range of vegetables, but also further recipes on how to use what you make. I riffed on their pumpkin kimchi recipe, and although it is still too young to fully appreciate, it is developing nicely. I am aided in my kimchi making by using a specially-designed fermentation kit from Mortier Pilon. This kit has everything you need to start making your own kimchi and pickles at home: a durable, cleverly designed fermentation crock that’s a third of the price (and weight!) of most crocks on the market, a rewritable label to identify each batch, and a booklet of user-friendly, thoroughly tested recipes to get you started. The interior of the Mortier Pilon crock is 100% glass. The white part on the outside of the crock is made of non-reactive, BPA-free plastic, and doesn’t come into contact with the food. There is also a channel in the lid that you fill with water. I don’t really understand how that enhances the fermentation but I’m going with it anyway. I normally make kimchi in a large glass jar, but this is more accommodating and somehow less smelly: maybe it’s the water ring? If you haven’t tried kimchi before, do pick up a jar or small pouch of it a Korean or Chinese grocery first. I wouldn’t necessarily recommend plunging straight into the world of the homemade ferments without seeing if you like this kind of thing. But if you like smelly cheeses, sauerkraut, Asian flavours or are generally up for anything, do give kimchi a chance. A little dab in a savoury dish is a great way to try it. Or grab a baking tray and and some tortilla chips or a rice cake (both are shown) and make some funky – in more ways than one! – nachos. The nutritional benefits of fermented foods are now pretty well established, but only if it has not been heat-treated. Certainly much of the sauerkraut you get in mainstream supermarkets is no longer active enough to help with gut function. Kimchi will give you a lot of fibre, calcium and vitamins A, B, and C, but its biggest benefit may be in its happy colony of lactobacillus – one of the most studied groups of the “friendly” bacterias. Some of the researched health benefits of kimchi include anti-cancer, anti-obesity, anti-constipation, colorectal health promotion, probiotic properties, cholesterol reduction, fibrolytic effect, antioxidative and anti-ageing properties, brain health promotion, immune promotion, and skin health promotion. It can also help keep recurrent yeast infections under control. But despite all of these benefits, I mainly love it for the taste. It may be an acquired taste, but for those who acquire it, kimchi is for life. And it may just enhance your life too. So, today I am giving you two recipes: for Sichuan Peppercorn Cabbage Kimchi and Sweet Miso Pumpkin (or Squash) Kimchi. I give the base recipe in the cabbage (first) kimchi recipe, so refer to it if making the pumpkin one as the base makes enough for both recipes. You may be worried that this revered food is difficult to make – it is pretty expensive to buy after all – but the prep is easy enough. There are however a few stages/days until you are able to eat what you’ve made. Your patience will however be rewarded. On your mark, get set – kimchi! For the cabbage kimchi the Sichuan peppercorns are optional, but I love the distinct tingle of cold spiciness from these little terracotta-red berries. 1 tbsp honey or sugar 0r 2 tbsp grated apple or pear – something sweet is needed to feed the bacteria. Equipment needed: large mixing bowl(s), sterilised large jar(s) or fermenting crock(s), a weight and plate (I used a boiled stone for my jar, and the the weight that came with my kimchi kit), cutting board and knife, plastic gloves for mixing with kimchi (or use plastic sandwich bags), blender or food processor (hand blender is fine). 1. Pour the water into a large bowl and add the salt; stir to dissolve. Rinse the cabbage and slice in half vertically; add to the large bowl. Weigh the leaves down with a plate topped with some kind of weight – I use a large round stone that I boiled in water and left to dry in the oven with my jar during sterilisation. Leave covered in a cool room for 6-24 hours. 2. Drain and rinse the cabbage under running water. Taste the cabbage and stop rinsing when it no longer tastes more than a tiny bit salty. The cabbage should be very soft. Squeeze the cabbage of its moisture in a clean tea towel. Cut into small pieces (about 3-4cm) and add back to the bowl. 3. Place all of the main kimchi paste ingredients to a blender or food processor (not the optional ingredients unless you are making a double batch of the cabbage kimchi, in which case use 2 tsp of Sichuan pepper) and blend until you achieve a smooth paste. Divide the batch in half and add the ground Sichuan peppercorns to the cabbage and the sweet miso and honey/maple syrup to the pumpkin one. 4. Add HALF of the paste (or all if making a double batch) to the bowl. Don your rubber gloves and mix the paste and cabbage very thoroughly with your gloved hands. 4. Pack the kimchi into your sterilised crock or lidded jar, pressing out any air from the bottom. Cover the jar/crock with a tight-fitting lid and leave at room temperature to ferment for two days. After this time put in the fridge for 7-10 days (seal in a plastic bag to prevent any aroma from leaking out). It is ready to eat now and will last in the fridge for up to two months. After this time it will still be safe to eat but the flavour will be very pronounced. Method: Mix the salt and pumpkin; cover and leave overnight at room temperature. Rinse well and carry on with the recipe, adding the miso and honey to the spice paste as indicated above. Place the coated pumpkin pieces in a jar or crock and leave covered overnight. Mix again, cover and refrigerate for 10 days. It should be used within five weeks. How long does kimchi last? Well-made kimchi can last a year or so, but I wouldn’t go that far. The longest I’ve kept homemade kimchi is four months. Do not use if it seems very “carbonated” or fizzy (a little tingle is fine but not if it sounds like you’ve opened a can of Coke) and the vegetables are mushy. Others say only toss it out if it has mould on it. I would err on the side of caution with homemade and use it within three month. Also, use only clean utensils to pull it from the jar as contamination by a dirty fork can shorten its life and taint the flavour. Seriously impressed with this and I would love to try making it too. The last two packs of shop bought kimchi I had, I ended up having to dump because in my haste at opening the pack in eager anticipation of my lunch, I took the kitchen scissors to open it but I split the little sachet of scary looking chemicals inside the pack (that are there to stop the pack exploding with gas?) so I ended up dumping the whole packed as some of the grains went into the kimchi :/ So this would solve that, thank you! Fermenting a pumpkin? That’s amazing! 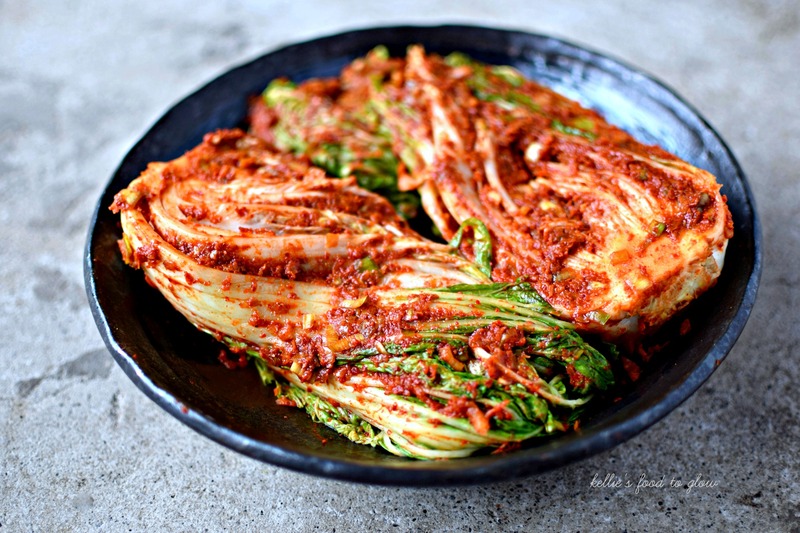 I would love to try it someday–kimchi is one of my favorite Korean dishes! The water in the lid is an air lock. The bacteria you want to grow don’t like oxygen , where as an open bottle allowing oxygen to come in will, will have harmful bacteria and unwanted molds developing well. Gasses from the first fermentation will eventually push out all the oxygen . the building pressure can escape buy pushing some gas through the water. BUT !! fresh oxygen can not go inside because inside pressure is always higher. In this way, first fermentation is done buy all kind of bacteria but later only a few lactic acid bacteria and a few other good species will push them into extinction. Therefore in the first days , its not a good idea to open your bottle too often and let fresh air go inside. After enough acid has formed , it not so critical ….